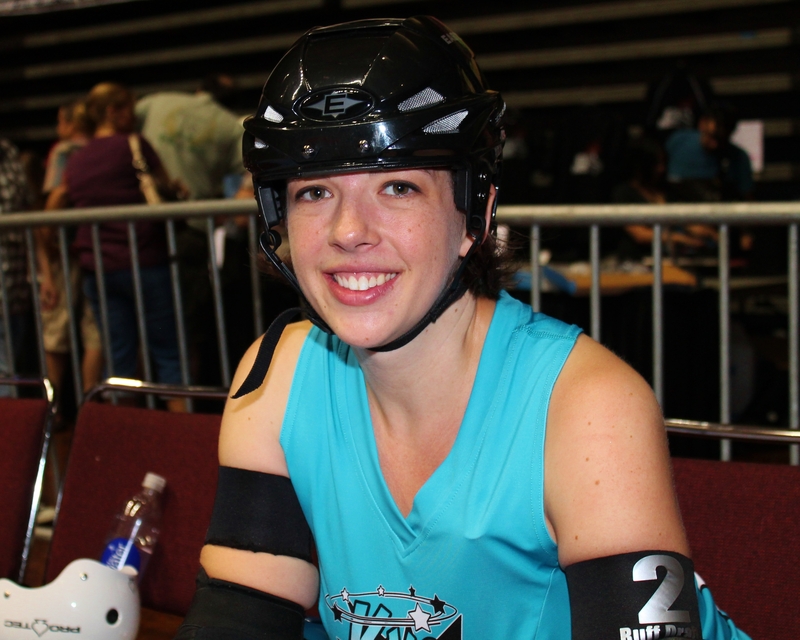 Our featured Roller Warrior for the month of July is Knockouts co-captain Ruff Draft! In 2007, we bought a ticket through Arts Alive! It was a combination ticket with an art gallery opening at the Hobbs Building combined with a ticket to roller derby at Hale Arena. My husband and I had been to a few Arts Alive! events and our reaction to this was, “how did we not know about roller derby in Kansas City?” We went to the bout and loved the energy, enthusiasm, and uniqueness of the sport. When I was first involved with derby there was a fantastic rivalry between Kelley Young on the Dorothys and Xcelerator on the Knockouts. Their jammer battles were epic. One bout, when I was a jammer referee, Kelley had gotten the better of X and flipped around to skate backwards to be a little showy. X was hot on her tail and laid her shoulder directly into Kelley. Kelley went flying but still got up with a smile on her face and a little nod of “you got me.” That’s roller derby. There are so many that I admire for different reasons, but my favorite has to be Delia Death. She always played with such fierceness and intensity, with the best expression of joy and fun on her face. This is a sport like no other, and a women’s organization like no other. While we welcome all shapes, sizes, and backgrounds, you can only excel if you are willing to work very hard and be a student of the game. You have to be smart, fit, and tenacious. It has taught me a lot about myself and the lessons we learn through derby can spill over into every aspect of our lives, increasing confidence in ourselves and empowering us to be stronger and more resilient. That probably sounds trite, but I have seen a lot of people change their lives after playing derby and I have seen our junior girls really come into their own when they did not fit into other sports. It is a powerful thing.